One of my favorite parts of the Cape has always been the Sandwich Boardwalk. I'm not one for being in the car so I love the idea of being able to see something amazing just a few minutes after crossing the Sagamore bridge. Not too long ago, I spent a few hours on the Upper Cape filming some aerial video footage of the boardwalk. 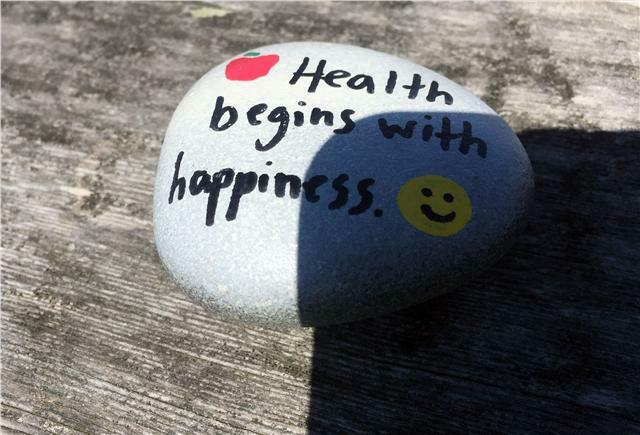 While I was there, caught the glimpse of a small rock with the words "Health begins with happiness" painted on it's back. There were several other rocks scattered throughout the rails of the boardwalk that were pretty neat but didn't think much of it and went onto my next location. Just one of the many rocks along the Sandwich boardwalk. I would up shooting some more footage at Sandy Neck Beach and as I made the trek onto the sand I saw what seemed like a garden of painted rocks with similar quotations as the one I had seen at the boardwalk. This time there was apiece of driftwood with a message accompanying the rocks. I thought the rocks were a great idea so I sent a half dozen-or-so photos to Becky to post on our social media channels. When she saw them she had the same sentiment as me, saying, "Holy cow, this is so awesome!" After a little research, we came across the Kindness Rocks Project Facebook and instagram pages with hundreds of photos of painted rocks throughout the world. The project has a few goals, #1: inspire others. #2: Recruit every person who stumbles upon it to join the pursuit of inspiring others through kindness! And after seeing them for myself, they've accomplished that with all of us at WeNeedaVacation.com!